available from Amazon.com or wherever books are sold. Blend your own mix of fragrant dried flowers and herbal tea into beautiful glycerin soaps, then wrap them with recycled decorative gift wrap and scrap ribbon for homemade gift giving. Creative Juice, by crafters Cathie Filian and Steve Piacenza, hosts of DIY Network’s Creative Juice, is a crafter’s dream book, with 45 clever ideas for recycling ordinary things into extraordinary arts and crafts. You’ll find photos and illustrations, along with “insider” crafting tips to create over 45 projects, including beaded rings, velvet and leather belts and bracelets, candle holders, soy candles, and bath time puppets for the kids. Use a kitchen knife to cut the block of glycerin soap into 1-inch cubes. Place the cubes into the glass measuring cup. Set the measuring cup into the pan, and fill the pan with water to reach halfway up the outside of the measuring cup, creating a double boiler. Set the stovetop burner on medium heat under the pan. Keep a watchful eye as the glycerin cubes melt – about 10 minutes. Stir as needed. Remove from heat and skim off any skin that forms on the surface of the glycerin. Add the lavender, chamomile, and contents of the tea bags to the melted soap. Stir to combine. Add a few drops of essential oil, and colorant if desired, and mix well. Pour the melted soap into the soap molds. If bubbles appear on the surface, use a spray bottle of rubbing alcohol to spritz the surface of the soap. Allow the soap to harden and cool. Then, pop the soaps out of the molds. To decorate rectangular soaps, recycle gift wrap by cutting strips to wrap around the bar. Secure the back with a small piece of tape, and tie off with a ribbon for extra pop. 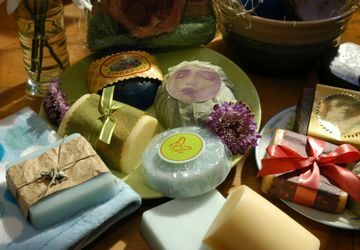 For round soaps, wrap tissue paper or cellophane around the soap, bringing the ends of the paper to the top of the bar. Seal it with a round piece of paper secured with glue. Decorate the paper with rubber stamps or stickers.